An important axiom of Buddhist philosophy is that existence is always associated with permanence. "Temporary existence" is an oxymoron in Buddhist thought, as is the phrase "contingent existence". By definition in Buddhism, existence cannot be temporary or contingent. Because of this axiom, Buddhists are constantly arguing against the existence or non-existence of certain features of experience and/or the world in ways that probably puzzle Western philosophers (at least, they puzzle me). A simple example that illustrates the kind of problems Buddhists have is referring to the trilakṣaṇāḥ as the "three marks of existence". As the Kaccānagotta Sutta (SN 12.15) makes clear, the term "existence" does not apply to anything which is impermanent. This confused use of the word "existence" where it does not belong, is only one of many confusions that ought to alert us to underlying problems in the Buddhist worldview. In this essay I try to show why this axiom is problematic and how it hampers Buddhists when they try to think about experience and the world. The question of what exists is one of the most enduring questions of philosophy, where philosophy is understood as the quest for knowledge about the universe, ourselves, and ourselves in relation to the universe. The study of what exists is known as ontology. It is usually considered alongside the second most important question of what can we know. The study of what we can know is called epistemology. In order to make definite statements about what exists, we ought to know about great deal about the subject. And yet for many philosophers there are barriers to what can be known about what exists, some would say that there is an epistemic impasse. If someone is making a strong statement about what exists or doesn't exist, it is usually very interesting to ask "How do you know?" Many religious people assert that they know things, but turn out to believe in an epistemology which does not allow them to know any such thing. Defining "existence" is difficult. Something that exists... just is. Our definitions cannot help but be tautological, because the concept of existence is fundamental to how we understand the world. We have to use perception as a reference point. Something is more likely to exist if we can experience it through more than one sense; if more than one person experiences it at the same time; or, if through some cunning apparatus we can observe features not available to our senses. Just to confuse matters, some people claim that experiences only they have had do exist; while others claim that experiences we all have all the time do not exist. So, generally speaking, existence is predicated on independent corroboration: something which is present, independent of a given sense or a given person is judged real (or more likely to be real). This comes back to an important point I have made about comparing notes. We gain objective knowledge of the world we experience by comparing notes with other people, or sometimes with our own previous observations, and using common features to eliminate the purely subjective (i.e. uncorroborated) elements of perception. What remains is objective, in the sense that we infer that it exists independent of our perceptions. A lot of philosophers discount or overlook the importance of comparing notes which I have called the solipsistic fallacy. It's easy enough to show that other minds must exist, at least in the sense of being independent of our own minds. (I did this in my essay, Buddhism & The Limits of Transcendental Idealism. 1 Apr 2016). Philosophers add another strand to the definition of existence. Something is real (i.e. it exists) if it can act as an agent of causality. This might seem simple enough, but the argument over what causality is, is far from settled. As Hume observed a few centuries ago, we never observe causality, we only observe sequences of events. Since events are clearly caused, Kant argued that causality was a metaphysical a priori - something that we humans bring to perception to make it comprehensible. To us, causality is real, but only because we could not understand experience without it. For physicists, who are mainly structure reductionists, this all boils down to the exchange of force bearing particles by mass bearing particles. Antireductionists point to emergent properties that are causal, and thus challenge the reductionist paradigm. But the status of mind is one of the key mysteries of ontology. What is mind? What is it made of? Does mind exist in the way that material objects exist? Since mind can only be experienced through mind (through what Buddhists called the mind faculty), and other minds cannot be directly experienced, the usual definitions of existence are suspected of being inapplicable in the case of mind. The status of mind in ontologies is an unresolved and hotly contested dispute. Some say that mind must be substantively different from matter, i.e. a separate kind of stuff (a position that emerges from substance antireductionism, i.e. dualism or pluralism). Others say that mind is an illusion (a position shared by some structure reductionists and idealists). A middle position is that mind is causal and thus real, but only as an emergent property of certain structural organisations of stuff, not as a distinct stuff (the position people who combine substance reductionism with structure antireductionism). Nothing about this is simple or agreed. Loads of people understand the disagreements, but no one has been able to produce an account of the world that approaches a quorum for a consensus. Most accounts of the situation take a position and try to convince us the others are wrong. But many plausible accounts exist for each of the positions and each has valid criticisms of other accounts. Having only recently learned about the distinction between substance and structure in these discussions, I find it plausible that some combination substance reductionism with structure antireductionism is the most productive direction to look for a satisfying answer. My understanding is that some complex structures do have emergent properties that are irreducible and causal. These cannot be understood in reductionist terms and thus reductionism as a general paradigm is falsified. It may be however that reductionism as a method for understanding structure is still valid at some levels under certain conditions, but as a general explanation it simply does not work. I also think that substance reductionism makes the best sense of the approaches to substance. But strong arguments against both of these positions are available. In the end, as always, what we choose to believe comes down to what we think is most salient in the discussion and that is powerfully affected by our existing worldview. All one can do, if one takes it seriously, is read opposing points of view and try to understand them on their own terms. And see where that leads. Given the state of our knowledge, any definite conclusions will be premature at best. But if I had to defend a position, today I'd opt for some combination of substance reduction with structure antireduction. A world made of matter, but featuring properties emerging from organisation or structuring that are irreducible and causal. With the caveat that some very clever folk disagree with each and every aspect of this position (and some who disagree with all of it). That the world we experience is constantly changing is obvious and this feature has been remarked upon in Western philosophy for millennia and continues to be remarked upon, even by those who have no contact with Buddhists. Some naive Buddhists think that "everything changes" is their special contribution to philosophy, but it isn't. As I remarked in 2011, Everything changes, but so what? (09 Sept 2011), everyone knows that everything changes. But if this is true, then it is quite a puzzle that Buddhists insist on this axiom that existence equates with permanence. If everything you can see is changing, it is quite counter-intuitive to conclude that existence requires an entity not change. This stance towards experience leaves Buddhist struggling to explain existence (in the everyday sense of the English word) and also struggling to explain change. In the early chapters of his Mūlamadhyamakakārikā, Nāgārjuna particularly struggles to explain change given his views on existence and time. The combination is incredibly unwieldy and he's trying to cram everything into verse. The result is so confusing that 2000 years later people are still writing articles claiming to have finally understood what he was trying to say (e.g. Loy 1985, Arnold 2012). One possible answer to why Buddhists might have adopted this axiom, and ended up making arguments against existence, is that at the time Brahmins believed in the existence of an unchanging essence of the universe, called Brahman. Each person reflected this universal unchanging essence in ātman. In an embodied human being, ātman played no part in daily life and was not affected by the turbulence of experience. All ātman does is provide a necessary link to the universal essence. One can discover ātman through introspection, and if one does this, it "becomes one's whole universe". The Sāṃkhya philosophy has something similar, i.e. a permanent, unchanging, passive observer at the heart of our being, which they called puruṣa. So the idea of a permanent unchanging essence that exists beneath the exterior layers of experience was common at the time we think Buddhism might have been getting started. But even if they were arguing against ātman or puruṣa, there is no need for the Buddhists to adopt the idea that existence is permanent or not at all. Perhaps what happened was that early arguments against ātman were encoded in stories that stipulated the Brahmanical belief as a starting point. This does happen in some stories, much as Socrates would often stipulate his opponent's view and they use logic to draw out nonsensical conclusions in an attempt to get the person to abandon the view. And perhaps, as time went on, it was forgotten which aspects of the stories were elements stipulated for the sake of argument and which were specifically subscribed to by Buddhists. This sounds like the Buddhists were not very clear on what they believed, which will strike many people as implausible . However we already know that this happened. Richard Gombrich has shown how Buddhists forgot various metaphors and jokes. In particular, the parody of Brahmanical cosmogony in the Agaññā Sutta (DN???) gradually became a Buddhist cosmogony. Similarly the Brahmanical gods (deva) and departed spirits (preta) were incorporated into Buddhist cosmology. These examples are summarised in Gombrich (2009). So perhaps the incorporation of this axiom was just an historical error? We don't know and I'm not sure how we would show that it was. In the end we just have to deal with the presence of this problematic axiom without understanding why Buddhists adopted it. A central proposition in Buddhist philosophy is the principle of conditionality. This principle says that "things" arise when the necessary conditions are present and don't arise when they are absent; that "things" ceases when the conditions cease. It's not clear from the Nikāyas whether or not the necessary conditions are sufficient for arising or not. "Things" can mean many things to many people, but I have found it useful to consider two broad domains. Firstly "things" can refer to mental activity. Mental activity occurs when a sense object strikes our sense faculty and as a result a sense cognition arises. When all three occur, we become aware of having a sense experience. So mental activity arises in dependence on the coming together of three conditions: sense object, sense faculty, and sense cognition. I have previously argued that this is the primary application of this principle. The main reason for highlighting this feature of experience is to explain why happiness is not found in experience. Secondly we can apply this psychological model to the arising of phenomena more generally. Indeed in Western Buddhist teaching, the conditioned nature of all phenomena is usually illustrated by pointing to the contingent nature of some complex object that is easily analysed into parts. This application is an example of what Richard H. Jones calls structure reductionism, the view that complex objects are merely collocations of elements; that they are merely the sum of these parts. Buddhists in particular insist that a person or being is simply the sum of their parts. In this view a complex object, like a being, can be completely understood in terms of the properties of their parts. There is no possibility of synergy and there are no emergent properties. It is true that in this approach, Buddhists nominate four mental elements, so the Buddhist reductionism is not equivalent to modern scientific structure reductionism in which all structures can be understood in terms of combinations of lower level elements, ultimately in terms of quantum fields. Despite the success of modern substance reductionism, which argues that the universe is made from one kind of stuff, structure reductionism largely fails to explain important aspects of our universe such as living organisms or consciousness. On the whole chemistry, biology, psychology and sociology (and related disciplines) can only be explained in terms of irreducible emergent properties, that is to say, in terms of structure antireductionism. Human societies cannot be understood by summing the properties of the individual human beings that make them up. They can only be understood by recognising that the relationships between people make an irreducible contribution. In terms of substance, a society is made up of people; but in structural terms we are forced to consider relationships that only exist when two or more people are interacting. Such structures and properties act as efficient causes, which means that, in Western philosophical terms we have to accept that such higher level structures are real. This need not lead us into substance dualism, because this is not a comment on the substance of the universe, only on its structure. And this distinction is one that is often lost sight of by scientists. (It's new to me this year). Although early Buddhists did distinguish between physical and mental sensations, they do not seem to have considered there to be two different substances account for this distinction. As far as I can tell, early Buddhists were not substance antireductionists or mind/body dualists. It's possible that the authors of the various Abhidharmas saw each kind of dharma that they enumerated as a different kind of stuff, making them substance antireductionists or ontological pluralists. Dharmas are an odd choice as fundamental stuff because none is in fact fundamental - all dharmas are conditioned by other dharmas and thus none exist independently (they do not "exist" at all in Buddhist terms, since they are temporary). There is a contradiction between these two domains of application of conditionality. I've said that conditionality applied to objects is structure reductionist: beings are no more than the sum of their parts. The contradiction is that the first application, to mental activity, appears to be antireductionist: an experience emerges from the collocation of sense object, sense faculty, and sense cognition. Also the new experience is causal in that it affects our behaviour unless we over-ride it. The experience is not inherent in any of the individual parts, but only emerges when they all work together in the presence of a sense object. Thus experience is an irreducible emergent property of these collocations:. Experience only emerges when all three factors are present and interacting in the right way; and it produces a phenomenon, experience, that cause us to respond in different ways. This is an example of structure antireduction. So when it is applied in the domain of experience the Buddhist principle of conditionality can seen as a structure antireduction; but when it is applied in the domain of objects, is usually described in terms of a structure reduction. I'm still not sure what to make of this contradiction, except to add it to the growing list of contradictions at the heart of Buddhist philosophy. A good many people make a huge error with regard to this principle of conditionality, including some renowned intellectuals. That error is to say that the principle of conditionality is a theory of causation. This is emphatically not the case. Early Buddhist texts say nothing at all about about causality or how things arise from conditions. To the best of my knowledge no Buddhist explanation of conditionality ever strays into trying to explain causation. There is no Buddhist theory of causation. Despite this Buddhists and Buddhist studies scholars ramble on about the Buddhist theory of causality and about the principle of conditionality as a theory of causation. Again I'm not sure what to make of the persistence of this egregious error. In our native philosophical traditions we would describe this collection of ideas as an ontology, i.e. a theory about what exists. But Buddhists have this axiom that what exists is by that very fact permanent. So Buddhists cannot say that something that arises when the conditions are present exists. Arising and existing have to be two different things in Buddhism. Sometimes people emphasise that Buddhism is about becoming rather than being. I've previously observed that "everything changes" is a rather banal observation that has been current in our native European philosophical traditions for throughout recorded history (about three millennia). "Everything changes" is just an obvious feature of the world, something to remark on and remember, but not on the level of profound revelation as Buddhists seem to make it. The reason "everything changes" is considered profound by Buddhists seems to relate to the axiom that existence must be permanent. It's only if one believes that existence is permanent that "everything changes" takes on such huge importance. So another puzzle is why a Westerner would cite this proposition as profound and quintessentially Buddhist. However, if things that exist must be permanent, it makes it very difficult to describe phenomena. I've said that the principle of conditionality was primarily a description of experience arising and passing away. The ontology of experience is tricky. If I experience the song of a blackbird, does that song "exist"? Or not exist? A "song" is a phenomena that occurs in my brain when I decode sound waves arriving at my ears and make them into something coherent. Neither existence or non-existence seems to apply. I do hear a song, but where is that song? Additionally, experience is constantly changing, even when the object of experience is not, because my attention and my mental processing of sense stimuli play a constant role in experience. Arguing that experience is neither existent nor non-existent is reasonably straightforward. I think most people would understand this. But this principle does not work so well in other domains. Applying conditionality to objects might have seemed like a way out of the impasse created by not being able to refer to them as "existent". After all, it's obvious to everyone that the world changes. If an object that changes cannot be said to exist, then we might lean towards concluding that it does not exist. The latter is the basis of idealism (the idea that all phenomena are only mental phenomena and that there is no mind-independent reality). Since early Buddhists acknowledge the role of objects in experience, idealism might seem like an unpromising approach for a Buddhist to take. Arguably, however, Yogācārins did adopt this approach. However, arguments about whether Yogācāra is a form of idealism continue to rage in academia. The pro and anti camps both put forward strong arguments, backed up by reference to authoritative texts. It's not clear to me which side has the better argument and I'm not sure I can bring myself to care enough about it to work it out. Yogācāra is a post-hoc theory that invents supernatural entities to solve it's problems. It's Occam's beard. Or something. However, if Buddhists rejected the idea that objects exist (as permanent entities), they also rejected the idea that objects don't exist (and permanently don't exist). We could call this an ambivalent ontology. As with the application of the principle of conditionality to mental activity, the idea is that objects are neither existent nor non-existent. But if objects don't exist and they are not non-existent, then what state are they in? It's much less clear that this works for objects in the way it works for mental activity. We can see why Erwin Schrödinger's thought experiment involving a cat has become a faux amis or 'false friend' for Buddhists trying to work with this ambivalent ontology (See Erwin Schrödinger Didn't Have a Cat. 29 Oct 2010). The cat is a metaphor for a subatomic particle that does not follow the laws of classical mechanics. The cat, and all physical objects that we can perceive through our senses, do follow the laws of classical mechanics. Macro-objects do not undergo superposition and are not affected by the observer effect (See Buddhism and the Observer Effect in Quantum Mechanics. 18 July 2014). Quantum mechanics has nothing in common with the confused ontology of ancient Buddhists. Many Buddhists and academics think Nāgārjuna was terribly clever to work through the permutations of these possibilities and reject them all. But he was not clever enough to question the premiss that existence must be permanent and all that this entails. His task would have been much easier if the idea of temporary existence was available to him. As it is, he fudges things in the end, because he has to admit a kind of contingent existence that ordinary people see as a self-evident fact, but which, apparently, disappears when one has become awakened. The problems created by permanence cause him to take one step towards a sensible ontology and two steps away from it. Rather than focus on the useful observation that existence is an evident property of objects that greatly simplifies any discussion about the nature of the universe or reality, Buddhists instead mainly focus on the the speculation that objects do not exist because they are not permanent. This leads many Buddhists into a kind of nihilism in which they claim that ultimately objects do not exist. Indeed, the most common traditional complaint about Nāgārjuna was that he was a nihilist. Most of the Buddhist world rejected Nāgārjuna's conclusions, or accepted them only with caveats introduced by later commentators, which mitigated his apparent nihilism. Of course modern day Mādhyamikas bristle at the suggestion of nihilism and claim to be misunderstood, but the charge has been around since about the 4th Century CE and like the charge of idealism against Yogācārins, it refuses to go away. Another problem emerges from the Western side of Buddhist modernism. From Plato we get the idea that phenomena are just the vague reflections of an idealised, noumenal world: they are like shadows on the wall of cave. It does seem to be true that the experiences we have a representations of the world, created by our brain, to optimise behaviour. Perfect accuracy in such a model is not required or desirable. Speed of response is an important factor. Rules of thumb get us through most situations. But there is absolutely no reasons to project our desire for perfection onto the world. There is no reason to put the physical world on a pedestal. Nor is there any reason to despise it in favour of some mythical world of perfection in the spirit realm. We only make it harder to understand the world when we leave these projections in place. The world is what it is. So we're left with this situation where reality is not only ineffable, but knowledge of reality is ostensibly accessible not through experiencing objects themselves, but only through mystical experiences in which one is cut off from all sensory experience. Reality appears to "exist" over and above objects; objects themselves only mislead us about reality. Most Buddhists appear to believe that objects are at best an illusion, but that perfect knowledge of a perfect reality is available to them via meditation. The failure of this knowledge to ever manifest seems not to deter this belief. Indeed those who do have breakthrough experiences in the present day all seem to agree that the traditional definitions of Awakening need rewriting, because they do not describe the lived experience. Confusion piles upon confusion. At the same time, Buddhists try to convince us that their philosophy is not only sublimely insightful, but represents the acme of human intellectual achievement, the ultimate truth. At present, I could hardly be less convinced of this claim. And for this reason I find the argument that Buddhist philosophy is relevant to the present rather implausible (for similar reasons I think much the same thing about all pre-modern philosophy). For a long time I resisted philosophy. Its not my forte, I don't have the background for it, and I've found the history of ideas more interesting. But it has gradually become clear as I explored the ideas of early Buddhism that there were problems that can only be addressed as philosophy. Western Scholars have been interested in Buddhism for about 150 years or perhaps longer. There is one plausible account of some Buddhist influence on David Hume (Gopnik 2009, 2015). Drawing influence from some novel and exotic ideas and actively thinking about Buddhism are two very different things. There is very little critical philosophical engagement with Buddhism. Academics are mostly historians of ideas, who work to clarify how Buddhists thought at a particular period in history. For some reason they always seem to want to present Buddhism in the best possible light. I suspect this is linked to the perceived prestige of their field and how that perception affects their standing in academia and their career path. And of course academia is increasingly being infiltrated by Buddhist clergy who bring with them commitments to traditional worldviews and belief systems. Historians of ideas use critical methods to clarify the ideas being discussed in texts, but they do not submit those ideas to any kind of evaluation in the light of the current state of knowledge. So scholars are still trying to clarify what Nāgārjuna said and to show how his philosophy works on its own terms, but they do not venture an analysis of how it works on our terms. Maybe because it doesn't? This raises a couple of questions. Should Nāgārjuna's philosophy be expected to work on our terms? Should our terms be the yardstick? Let me clarify here that by "our", I mean modern people. Modern knowledge is contributed to by people of many ethnicities, nationalities, etc. The contrast is between traditional and modern, not between Asia and Europe. Asia is modern now too. I do not say that Nāgārjuna's writing is not a valuable account of Indian thought in the 2nd Century CE. His texts have an intrinsic value in the history of the human search for knowledge. The history of ideas is important and it deserves to be studied in the same way that history is studied more generally. And the existence of a European bias in history is problematic because it is too narrow to accurately reflect how humans have conceived of the world. Knowledge is also superseded from time to time. Just as the Greek philosopher Parmenides (who thought that "everything that exists is permanent, ungenerated, indestructible, and unchanging") is taught in classes on the history of philosophy, but not in science classes; Nāgārjuna's relevance is to history, not to the present. But Buddhists often write about Nāgārjuna is though he is the best philosopher in history and absolutely relevant to the present. And yet Nāgārjuna epitomises the pre-modern philosopher who never questions his own religious assumptions about the world and merely tries to shape the world to his conclusions. Knowledge is superseded because those currently involved in research will find a flaw in a theory, discover new evidence, or find a better way of conceptualising a problem. We may complain about conservatism in our field, but paradigm shifts do occur. In Buddhist studies we have seen shifts in historical paradigms in, for example, how we conceive of the early Mahāyāna. What we have not seen is any shift in the paradigm of how Buddhist Studies scholars evaluate Buddhism. An exception might be Paul Williams, who after some years of following the Gelugpa scholastic tradition of Buddhism; converted back to Roman Catholicism, citing dissatisfaction with Buddhism. Many of us that follow other forms of Buddhism are equally dissatisfied with Gelugpa Buddhism, we don't see the need to throw the baby out with the bathwater. Leaving aside the natural antipathy between Christian and Buddhist philosophy, where is the critical evaluation of Buddhism qua philosophy? One has to look beyond the literature of Buddhist Studies, but even then it's sparse. Of the hundreds or perhaps thousands of papers on Buddhism I've read over the years, I can think of only a handful that evaluate Buddhist ideas for coherence, plausibility, or applicability. It never used to occur to me that this lacuna was significant. I suppose I just thought that of course these Iron Age and Medieval ideas would still be relevant. To a Buddhist, anything Buddhist is always relevant. Though this is not a mistake any scholar would make about European philosophy. None of the papers I'm thinking of reference the others and so they are not part of any kind of concerted response to Buddhism in Western terms. Christian theologians may well be an exception to this, but they are hardly relevant to contemporary philosophy. The upshot is that, as far as I know, no philosopher has ever considered, let alone questioned or critiqued the Buddhist axiom that existence and non-existence are always permanent states. No one I have ever talked to about Buddhist doctrine has ever bought it up. My Buddhist teachers have not remarked upon this oddity. So there appears to be no critical response to this central axiom of Buddhist thought. Poor philosopher that I am, I think I see a number of problems with Buddhist philosophy that would provide plenty of scope for research. Arnold, Dan. (2012) The Deceptive Simplicity of Nāgārjuna's Arguments Against Motion: Another Look at Mūlamadhyamakakārikā Chapter 2. Journal of Indian Philosophy 40(5): 553-59. Gombrich, Richard. (2009) What the Buddha Thought. London, Equinox. This is a long-read (~ 5000 words) polemical essay about parts and wholes; about analysis and synthesis; about substance and structure. It's about the tension that exists between modern ways of thinking about these things and traditional Indian Buddhist ways of thinking about them. About why the traditional ways of thinking about them are a philosophical and practical disaster. In 2009 I wrote about the Vajirā Sutta which contains one of the most famous similes in all of Buddhist teaching, i.e. a being is made up of skandhas in the same way that a chariot is made up of wheels, axles, etc. We take this to imply that a being is no more than the sum of its parts. Similarly any complex phenomenon (saṃskāra) is merely the sum of the simple phenomena (dharma) that make it up. This argument may also be familiar to us via the allegorical story of the axe (or shovel). The man in the story says that this is his favourite axe. "Of course," he adds, "I've replaced the handle several times and the head also." The clever Buddhist leaps to an Aha! at this point because man has trapped himself in a foolish error (one that we apparently make constantly), which is to consider this to be the same axe. We assume that it cannot be the same axe if all its parts have been replaced. After hearing this little parable, the maxim "everything changes" is trotted out, heads nod sagely, and it's game over for common sense. We never question the explicit reductionist assumptions, that come to us from ancient India, that complex objects are merely the sum of their parts and no more. This essay questions that assumption, and tries to show that it is wrong. The idea that we don't exist except as the minimal sum of our parts and no more is so counter-intuitive that it makes very little headway in most people's minds. A few nihilists are attracted to the idea that we are nothing more than the sum of our parts, but I think most people find nihilism a bit off putting. Indeed the Western way of thinking leans towards the opposite conclusion, that things are considerably more than the sum of their parts with a large dose of woo. This is, for one thing, why we find the afterlife so plausible. Ironically, both of these central Buddhist doctrines require us to be greater than the sum of our parts, even though this contradicts the story of the chariot. It is yet another incoherence at the heart of Buddhist metaphysics. 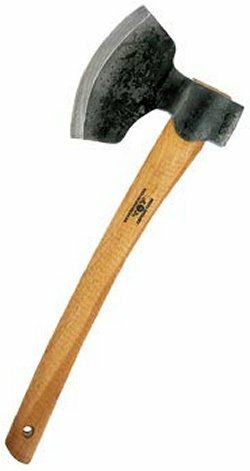 If I replace the head and handle of an axe, is it still an axe? My starting point for this essay is to ask if anyone would dispute that the axe in the story is still an axe? Or, having replaced the parts of the axe, has it become something other than an axe? I think most people would agree that the combination of an axe-handle and an axe-head together, aligned in the right way, would always make an axe. No matter how often we change the parts. Potential there is always an axe and as long as we continue to supply axe-heads and axe-handles, there always will be an axe. Not an unchanging axe, to be sure, but the axe will exist in every sense of the word as we use it in English (though not in Pali or Sanskrit, but we'll come to this). This point is often lost in the telling of the parable. We get out of it what we want to get out of it, which is confirmation of our existing belief in the contingency of the world. What we do not see, due to this confirmation bias, is the important point that no matter how many times we replace the parts with other suitable parts, the object is still an axe. And if the axe is still an axe, no matter how many times we replace the parts, then there is an invariance that is not accounted for by our reductive Buddhist theory. Something is not changing. But that something cannot be found by reducing the axe to its parts! In fact, the act of reducing the axe to its constituents obliterates the something and apparently allows us to claim that it never existed in the first place. So then, what were we chopping our wood with before we broke our axe? Another view is that the axe is not simply the sum of its parts. 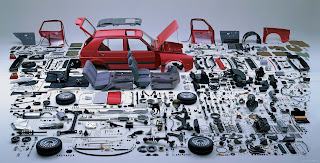 It functions because its parts are put together in a particular way. In other words it can function as an axe only because it is structured or organised as an axe. Any appropriate materials can be used. A stone-headed axe is still an axe, because it has the same structure and is used for the same function. So any composite object, including a human being, is greater than the sum of its parts because structure gives those parts a unity and allows them to function (to be causal) in ways that are not implicit in the mere materials. Steel and wood can be structured in a variety of different ways to make objects with different functions - related tools for example (saw, chisel, hammer, adze, spear, arrow, etc). But steel and wood could be make into something entirely different. A clothes-peg for example. A desk. A picture frame. In these examples the parts also have structure. Structure can manifest at different levels. And structure at one level need not influence structure at another - having shaped a steel blade and a wooden handle, we are still free to configure them as different tools depending on our desire. As early as 1843, John Stuart Mill was making the same point about chemistry (see Mill 1868). To use an example from one of his later contemporaries, the properties of a water molecule cannot be understood by adding together the properties of hydrogen and oxygen. In the chemical reaction that creates water from hydrogen and oxygen something new has come into being. It is not new in substance, since we know that it is composed of two hydrogen atoms and one oxygen atom. But it is new in structure and function. 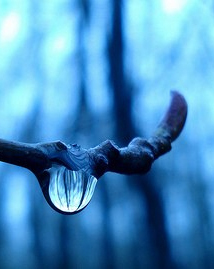 Water is greater than the sum of its parts. It interacts with the world in ways that a simple mixture of hydrogen and oxygen cannot, in fact water is utterly unlike a simple mixture of hydrogen and oxygen. George Henry Lewes (1875) introduced a new term for these new properties: emergent. Complex objects have emergent properties that are not inherent in their constituents, but only emerge when the parts are welded into a structured whole. The point is that this is true also of our bodies. We replace atoms, molecules and cells as we go along, so that the elements that make up our bodies now, are different from those which made it up when we were born. Although some brain cells tend to remain throughout our lives once they appear. Similarly though the cell is the fundamental unit of living things, not all cells are identical in the way that all electrons or carbon atoms are identical. Just as identical and interchangeable atoms make up a variety of different molecules, there is no reason for evolution not to create infinite variety based on the basic structural features of the cell, e.g. brain cell, nerve cell, muscle cell, blood cell etc. The structures of lipids, proteins and nucleic-acids are important, but they don't fundamentally limit how cell might diverge (as long as it has the basic structural features of a cell). The principle I am describing has several different names, the two most common are structure antireductionism; and emergentism. Some form of antireductionism seems to have been adopted by Aristotle, but J S Mill's explanation of it is the starting point for a more serious modern discussion of the principle. I became aware of this coincidentally after starting to read a series of blog posts on The Brains Blog by William Jaworski, who was aiming to provide an introduction to his book Structure and the Metaphysics of Mind (2016). Searching for background on his argument, I found an excellent introduction to the subject by Richard H. Jones (2013), whose work on translating the Prajñāpāramitā and Madhyamaka works I have cited in the past. Jones is a thoughtful writer who seems to write at the right level for someone like me. The book is genuinely introductory in that it doesn't seem to assume too much prior knowledge of the subject, but its also focussed and serious and takes me deeper into the subject. Jones tries to present all sides of the argument, while clearly favouring a view that might be called substance reductionist & structure antireductionist. Currently in terms of substance it is clear that physics accurately describes the world we live in. But structure reductionism is an abject failure in accurately describing our world. It explains nothing. On the other hand structure antireductionism has some unsettling consequences. It says that every single new level requires its own rules: water does not simply have emergent properties, but these emergent properties are real and this level of reality requires its own explanation. This might be the death knell for the great unification project that has been a characteristic of Western knowledge production since the ancient Greeks. The usual Buddhist point of view is this: we are simply the sum of our parts (often those parts are the skandhas); and the parts that make us up are constantly changing; so we don't exist in a permanent sense. And ancient Indian Buddhists always use "exist" to mean permanently existing without alteration or any possibility of change. So if we are arguing against an ancient Indian Buddhist then this is demonstration of an existing but yet changing entity is to them an oxymoron. The statement that an axe can exist but also change is self-contradictory. This reductionist argument based on the skandhas (or dhātus or whatever), which is self-consistent, is seen as a powerful confirmation that our Buddhist views reflect reality, but it entirely leaves out the question of structure. It does not acknowledge that a person persists over time as a structure, if not as a collection of the same parts, then as a series of parts making up the same structure. Because Buddhists were committed to this reductionism, they could not acknowledge the way that structure makes complex objects greater than the sum of their parts. Most Buddhists still cannot. However, this Buddhist form of structure reductionism has all the same problems as the structure reductionism of scientists. It doesn't work. What Arises In Dependence on Conditions? S: Arising is this disappointment arising; ceasing is disappointment ceasing. C: Disappointment arising, arises; disappointment ceasing, ceases. Experience here is not characterised as duḥkha or unsatisfactory; it doesn't have unsatisfactoriness as a quality; experience is duḥkha. In this context experience is synonymous with the world (loka) of experience. In early Buddhist texts duḥkha and loka are ways of talking about the same thing, which was first noted by Sue Hamilton (2000). The parts that a person or indeed the world is supposedly made up from, the skandhas, turn out to be more like the apparatus of experience or the experiencing factors. So Buddhists usually misapply there own most significant formula to "reality" and try to make pratītyasamutpāda an theory of what exists (ontology) or worse, a Theory of Everything (TOE) that exists. It does the job badly. The skandhas are far too flimsy to represent the world or even objects in the world, and 4 of the five are mental and thus nothing to do with the mind-independent world anyway. Given that it describes experience well and the mind-independent world badly, I give the early Buddhists the benefit of the considerable doubt and assume that it was intended to only describe experience. The parts (skandhas) are aspects of how our minds create our experiential world from sense impressions of the world. The possibility of mind-independent reality is left open and never addressed by early Buddhists, though experience really only makes sense if there is one. In other words, pratītyasamutpāda is not a theory of what exists or how the world works, but a theory of what experience is and how it works. It says nothing about the axe per se. On the other hand this is exactly how most Buddhists in history have taken pratītyasamutpāda. Recently I started asking myself a question about what is real. Not in an "I can't tell what's real, I'm going mad" kind of way, but in a reflective philosophical way. In particular, I've previous written about the importance of scale on how we understand the world. The rules that apply on one scale may not apply on another. There are obvious examples of this. The kinds of objects that we can perceive with our naked senses follow laws described in classic mechanics and chemistry. However at the nano-scale, these rules are not followed and another type of mechanics, quantum mechanics, are required to describe their behaviour. This was so far from being intuitive that in 200,000 years of anatomically modern humans, it is less than a century since these new rules were first described in detail. If we fire a rifle into the air, the bullet gradually, smoothly slows down due to friction over-coming inertia. Gravity makes the bullet describe a parabolic curve, though one that is gradually compressed as it slows down. If I shoot a mass-less photon into the air will travel in a flat curve that is determined by curvature of space, but which at the surface of the earth may appear to be a straight line. A photon does not experience drag in the atmosphere, but will keep going until it collides head on with something, at which point it will undergo an instantaneous transition to a different energy level that is a multiple of some constant (a quanta in other words). Bullets do not behave like photons and vice versa. There is a discontinuity between the different scales so that different fundamental laws apply. This was the point of my essay Erwin Schrödinger Didn't Have a Cat (29.10.2010). What applies to a sub-atomic particle does not apply to a cat; and vice versa. The cat is a metaphor. Matter at the nanoscale is governed by probabilities, with some real limits on what we can know via Heisenberg's Uncertainty Principle. For example, the more precisely we specify the position of a particle, the less we can know about its momentum; and vice versa; and similarly with other pairs of quantities. Matter at the macro-scale, in sharp contrast is governed by cause and effect and we can very precisely specify both position and momentum for any macro object. Matter on the nano-scale is discreet and digital (quantised), matter on the macro-scale is continuous and analogue. And so on. This creates a problem for determinists. Determinism is a product of structure reductionism. 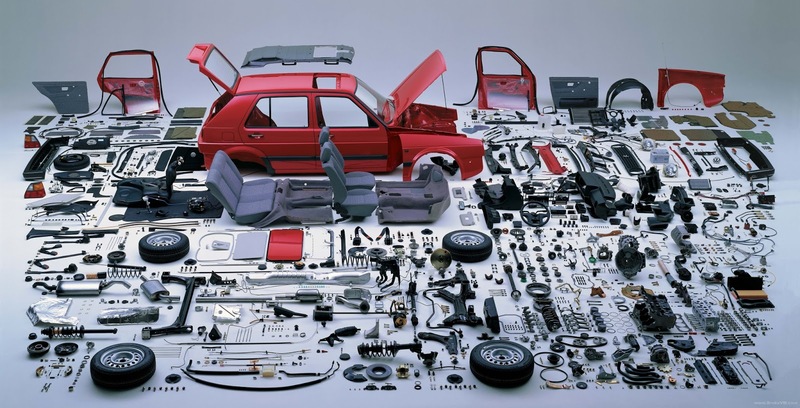 In the structure reductionist view, everything can be explained by breaking the world down into its components and describing how those components behave. At present, the best explanation seems to be that the world is fundamentally made of a number of interacting quantum fields (not that I understand quantum field theory!). The interactions of these fields is what leads us to see particles and forces when we look at the universe at the appropriate scale. Quantum mechanics describe the behaviour of individual particles that are the manifestations of quantum fields interacting, but quantum mechanics is not deterministic, it is probabilistic. The matter that we can perceive with our senses does not, despite what certain "spiritual types would have us believe", follow the same rules as the particle does. The probabilistic quantum world does not determine the macro world. This means for example, that deterministic arguments against freewill fall short if they are rooted in structure reductionism. Within introducing any woo factor, determinism is simply not a convincing explanation of higher levels of structure and organisation. Determinism does not predict emergent properties. Another major discontinuity occurs at larger scales when classical mechanics also fails to provide a good description of matter and we must shift to using relativistic descriptions. And finally at the scale of the whole universe some unknown force is causing the universe to expand at an increasing rate. When we look at galaxies they are accelerating away from each other and we do not understand why this is, though we refer to the phenomenon as "dark energy". And the thing about these distinctions of scale is that they have almost no effect at different scales. Clever chemists can make some large molecules behave as particles, under special conditions, which is no doubt interesting as it blurs the boundaries between levels. But, at the macro-scale we typically interact with at least sextillions (1021) of molecules at a time and we never see probabilistic behaviour. To our naked senses there is no observer effect, no tunnelling, no entanglement, no (self)interference, and so on. Similarly when we look at the world with our naked senses we do not see curved spacetime or have any reason to see space and time as related. Space looks flat. Everyone thought it was flat until 1919, when English scientist Arthur Eddington disproved this proposition by observing the bending of the path of photons passing close to the sun. This could only be explained by the curvature of spacetime itself (the first of many successful tests of the accuracy of Einstein's General Relativity). Another way I have developed for looking at the problem is that lower level physical laws are more general; higher level laws are more specific. So there are physical laws that govern atoms, that describe and circumscribe the nature of chemistry, e.g. thermodynamics, electromagnetism, etc. Such laws describe the possibilities at the next level of complexity, but they do not specify which of the possibilities will manifest, or how that level will appear to us. Of all the possible molecules, only some occur naturally in the set of conditions set by the conditions on the earth, one of the main contributions comes from the higher level level of interconnected ecosystems of organisms (or Gaia, if you like). Though it is a debatable proposition as to whether higher level structures are capable of downwards causation. Similarly the laws that govern the emergent properties of cells describe and circumscribe the nature of evolution, but they do not specify which species will evolve at any given time. Evolution is governed by higher level laws like natural selection. Perfect knowledge of the first cells would not give us the ability to predict what life on earth would look like at any point in time. It would only allow us general knowledge about life now. For specific knowledge we have to go to higher levels. Higher levels must be studied in their own right and though they are circumscribed by lower level laws, the emergent properties of higher levels are not determined by lower level laws. Another potential confusion for Buddhists is that the act of analysis, the success of analysis as a method, does not validate reductionism. The success of analysing experience into skandhas does not validate the doctrine that there are only skandhas and nothing else. Antireductionists generally acknowledge the usefulness of analysis. In understanding a cell it is helpful to know how and of what the structure is composed. Just as in understanding water it is useful to know that its parts are two hydrogen atoms and one oxygen atoms; or that an axe is made from head and handle. Reductionism requires us to accept that the whole is only the parts, and that all levels collapse to the lowest one we can imagine. It is clear that this is a bar to understanding the behaviour of wholes. It is one thing to say, for example that the brain is made of atoms, it is another to say that a full knowledge of quantum mechanics is sufficient to understanding human behaviour. The further apart the levels are, the less likely this proposition seems. Emergent properties, and emergent laws, manifest at every level of complexity: atoms don't behave like quarks, molecules don't behave like atoms, cells do not behave like molecules, organs do not behave like cells, organisms do not behave like organs, organisms with brains do not behave like organisms without brains. At no point does perfect knowledge of a lower level ever lead to a full understanding of a higher level (or vice versa). I'm often appalled by how simplistic Buddhist arguments about philosophy are (and I am far from being the world's most sophisticated philosopher!). All too often I see all scientists written off as "Materialists" or "Physicalists" for example, and all of their knowledge judged as irrelevant to the Buddhist project. I've complained about this before (see Physicalism, Materialism, and Scientism. 8 Aug 2014). No consideration is given to issues of how individual scientists might approach substance, structure, theory, or method. When I read someone like founder of the Triratna Order, Sangharakshita, complaining about scientists insisting on a "mechanistic" view of the world, I cannot help but be depressed that his knowledge of science seems to stop at the end of 19th Century. Similarly with many other prominent contributors. The Big Bang “model” (hot expanding universe) is true; the BB “event” (early singularity) is just conjecture." All too much of what passes for intellectual discourse in Buddhism is bad philosophy and bad science. I've written about the various problems I've found in closely examining Buddhist doctrines. I find very few Buddhists (or Buddhist Studies scholars for that matter) are at all interested in such problems. And I've also written quite a lot on why people continue to find religious ideas intuitive and even compelling. So it's not surprise to me that I meet resistance when I talk about problems in Buddhist doctrine, but it can still be quite frustrating. This particular problem is one that ought to really shake Buddhists. Buddhism is both substance and structure reductionist. The substance reductionism, which distorts a model which was originally a description of experience into an ontology, is incoherent. It is possibly the worst description of the universe that has ever been seriously considered. It is one thing to reduce experience to dharmas or cittas, but to try to reduce the whole world, everything, to dharmas? That leaves us confused. Dharmas are not good candidates for the ultimate substance of the world because they are irreducibly subjective. But worse, where they do make predictions about the world, they are demonstrably wrong. If we restrict this theory to the epistemic domain, or what we can know about the world, then some of the claims made stand up. But Buddhists insist that it applies to the ontic domain, to what is. Subjectivity probably does affect how the world looks to us, does not determine how the world is. But in practice what we find is that Buddhist theories of what the world is made of are just wrong. Most Buddhists hold a dualist or vitalist view in which consciousness is a distinct substance. This view is no longer tenable. And it turns out that the world is made of particles and/or energy. Buddhist is just completely wrong about the substance of the world. Buddhist substance reductionism might have worked as psychology, but as ontology it is laughable. The structure reductionism of Buddhists causes most of us to believe that complex objects do not have emergent properties, but can be considered as admixtures of the properties of their constituent parts. In this view, a being is no more than the the combined properties skandhas. Since, emergent properties are so much a part of modern discourse I imagine that many Buddhists would be concerned to know that their worldview denies the very possibility of emergent properties. Especially those who are enthused by general systems theory (often via Joanna Macy's book Mutual Causality in Buddhism and General Systems Theory: The Dharma of Living Systems). Perhaps the late invention of interdependence solves the problems caused by denying emergent properties (without which general systems theory doesn't work), but I don't see how this helps. Mutual causality still reduces all structures to the simple additive properties of the constituents, so it does not allow for emergence of new causal entities. Ironically, various Abhidharmas did invent different kinds of causality to try to solve the problem of maintaining continuity between action and consequence, but as we've seen this explanation fails (see The Logic of Karma. 16 Jan 2015). And in any case they still reduce all forms of causality to one. But the really great disaster of Buddhist philosophy is the insistence on equating existence with permanence. This is an error of such great proportions and such catastrophic consequences that it is hard to over state it or forgive it. That most people who talk and write abut Buddhism never address this foolish criteria or adjust their language to account for it is another indictment of out intellectual culture. If we only remove this unnecessary restriction then, at the very least, we can dispense with the tortures of studying Nāgārjuna and Madhyamaka, which are entirely framed within this unworkable ontology. And the world would be a better place for it. What I wonder is how Buddhists ever came to be so triumphant about their philosophy. How does a group with such a grossly defective view of the world end up trumpeting their superiority over all comers? It's a joke right? I've said this before, but the Emperor has no clothes! And the scholars who are supposed to be objective about Buddhism are all so in love with it that they don't see it either. Since more and more monastics, with explicit commitments to medieval religious worldviews, are infiltrating academia, this situation is only going to get worse. Worryingly, the same scholars are often part of a movement that seeks to impose the teaching of Indian "philosophy" on university philosophy departments! Something is rotten in the state of Buddhist philosophy. There's just no mileage in the kind of reductionism that is axiomatic in Buddhism. At the very least we need to think in terms of structure antireductionism and emergent properties, and this involves at the least rejecting traditional reduction to the skandhas. It would also help to clarify the way in which substances reduce, not to subjective mental constituents, but to objective quantum fields. Do I even need to repeat that I think that Buddhist claims to understand the true nature of reality are laughable? Of course the remaining uncertainty over how to think about consciousness is going to make it difficult to really deal a death blow to traditional Buddhism - it will cling to life by claiming to have understood and explained consciousness (though it doesn't). Clearly the brain itself is subject to substance reductionism, it's made of matter. Substance reduction is completely useless for producing plausible theories of consciousness. But how the structures of the brain produce a first person perspective is not understood. If it is to be understood, it seems that a structure antireductionist approach is the most promising. And since Buddhists are structure reductionists, it seems unlikely that they will have much to contribute. Buddhists need to take stock of what they believe. We need to stop papering over the cracks and being flattered by the attention that we get from outsiders. We need to hold our hands up and admit that, as sophisticated our intellectual defences are, we don't really understand much at all. Where we think we do understand, we often seem to be deeply confused and flailing. Jaworski, William. (2016). Structure and the Metaphysics of Mind: How Hylomorphism Solves the Mind-Body Problem. Oxford University Press.